Are you looking for a warehousing job? Use this sample to stock up on tips for creating your own winning resume. To be the successful job candidate for warehouse associate jobs, it helps to have a comprehensive resume. 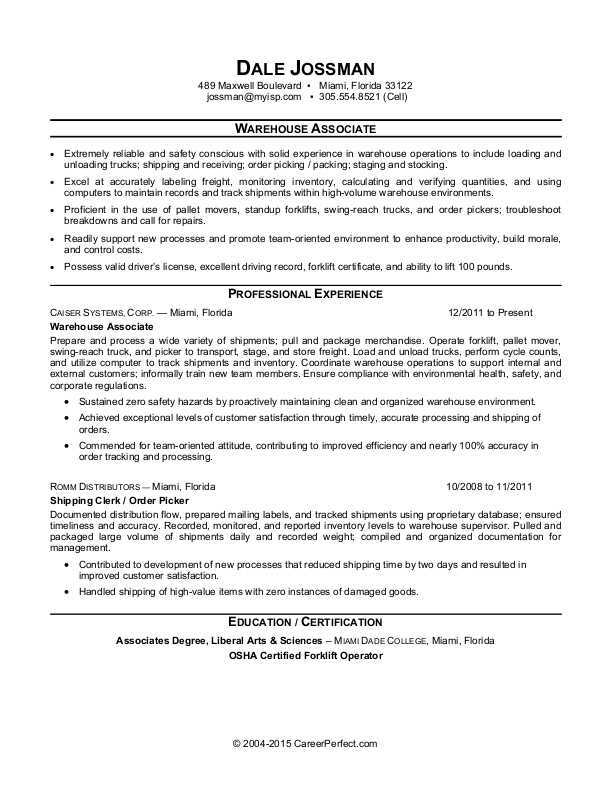 For inspiration, view the sample resume below, and download the sample resume for a warehouse associate in Word. Jobs for warehouse associates are projected to grow by 7% (Or 271,700 jobs) from 2016 through 2026, according to the Bureau of Labor Statistics (BLS). You’ll find the highest level of employment for this job in the following states: California, Texas, Illinois, Pennsylvania, and Florida; and in the following metropolitan areas: New York City, Chicago, Los Angeles, Atlanta, and Riverside, California. As a warehouse associate, you can expect to make a median wage of $25,870 per year, or $12.44 per hour, according to the BLS. Additionally, you can learn about production and operations careers and search for warehouse associate jobs on Monster. Extremely reliable and safety conscious with solid experience in warehouse operations to include loading and unloading trucks; shipping and receiving; order picking / packing; staging and stocking. Excel at accurately labeling freight, monitoring inventory, calculating and verifying quantities, and using computers to maintain records and track shipments within high-volume warehouse environments. Proficient in the use of pallet movers, standup forklifts, swing-reach trucks, and order pickers; troubleshoot breakdowns and call for repairs. Readily support new processes and promote team-oriented environment to enhance productivity, build morale, and control costs. Possess valid driver’s license, excellent driving record, forklift certificate, and ability to lift 100 pounds. Prepare and process a wide variety of shipments; pull and package merchandise. Operate forklift, pallet mover, swing-reach truck, and picker to transport, stage, and store freight. Load and unload trucks, perform cycle counts, and utilize computer to track shipments and inventory. Coordinate warehouse operations to support internal and external customers; informally train new team members. Ensure compliance with environmental health, safety, and corporate regulations. Sustained zero safety hazards by proactively maintaining clean and organized warehouse environment. Achieved exceptional levels of customer satisfaction through timely, accurate processing and shipping of orders. Commended for team-oriented attitude, contributing to improved efficiency and nearly 100% accuracy in order tracking and processing. Documented distribution flow, prepared mailing labels, and tracked shipments using proprietary database; ensured timeliness and accuracy. Recorded, monitored, and reported inventory levels to warehouse supervisor. Pulled and packaged large volume of shipments daily and recorded weight; compiled and organized documentation for management. Contributed to development of new processes that reduced shipping time by two days and resulted in improved customer satisfaction. Handled shipping of high-value items with zero instances of damaged goods. Before you submit your resume to warehouse job ads, do a double-check that your skills and experience are prominently displayed. Could you use some help with that? Get a free resume evaluation today from the experts at Monster's Resume Writing Service. You'll get detailed feedback in two business days, including a review of your resume's appearance and content, and a prediction of a recruiter's first impression. It's a quick and easy way to make sure your resume's inventory is properly stocked.